Episode #102: Happy Birthday, Noel Neill! Noel Neill was born on November 25, 1920, on Thanksgiving Day! She holds the distinction of being the only performer to appear in all three film versions of Superman: the 1940's serial, the 1950's TV show and two movies, SUPERMAN: THE MOVIE and SUPERMAN RETURNS. THE FIRST LADY OF METROPOLIS, the special feature documentary to the season 2 boxed set of THE ADVENTURES OF SUPERMAN. LOOK UP IN THE SKY! THE AMAZING STORY OF SUPERMAN, narrated by Kevin Spacey. NEXT WEEK: SUPERMAN IN EXILE, PART IV: ACTION COMICS ANNUAL #2, 1989! SUPERMAN FAN PODCAST is a proud member of the League of Comic Book Podcasters at http://www.comicbooknoise.com/league and the Comics Podcast Network! http://www.comicspodcasts.com. You can join the SUPERMAN FAN PODCAST and MY PULL LIST groups at facebook. Keep updated on the podcast and blogs on twitter @supermanpodcast. SUPERMAN FAN PODCAST can be found at http://thesupermanfanpodcast.blogspot.com/ . Expanded show notes are at http://supermanfanpodcast.blogspot.com. Send e-mail to supermanfanpodcast@gmail.com . The theme for the podcast is PLANS IN MOTION composed by Kevin MacLeod, part of the royalty free music library of the web site http://incompetech.com . Thanks for listening to SUPERMAN FAN PODCAST and, as always, thanks to Jerry Siegel and Joe Shuster. 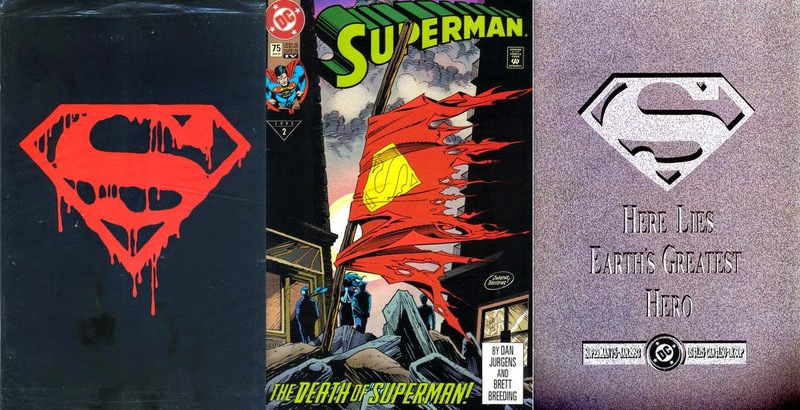 Episode #101: The Death Of Superman! SUPERMAN issue #75, the January 1993 issue, was published on November 17, 1992. Over 3 million copies would eventually be sold. Some comic book stores sold 10,000 copies that day, with customers lined up around the block. This episode doesn't explore the story or plot itself, but its creation and the publicity frenzy in its aftermath. To listen to past episodes about the DEATH OF SUPERMAN stories, go to episdoes #86 and 89. SUPERMAN: DOOMSDAY animated movie special feature: REQUIEM & REBIRTH: SUPERMAN LIVES! NEXT EPISODE: Happy Birthday, Noel Neill! Episode #100: ACTION COMICS #100 & SUPERMAN #100! Action Comics 100 & Superman 100! 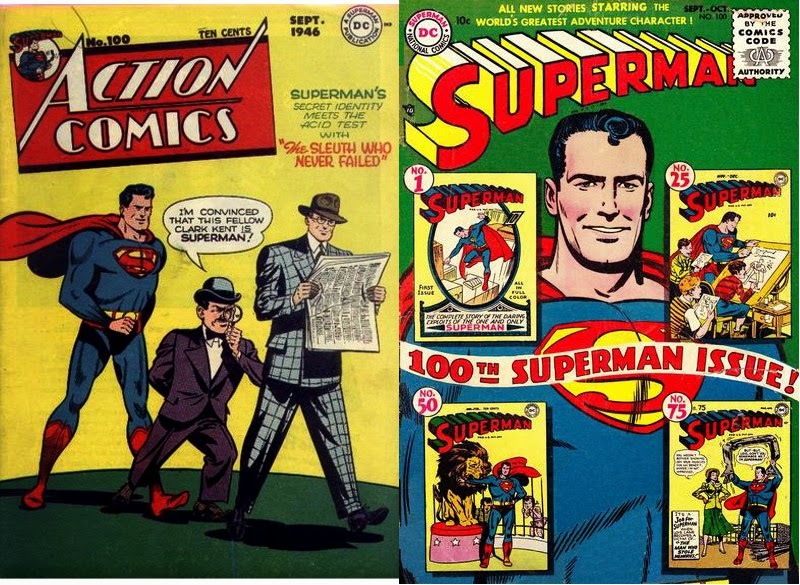 Continuing the tradition, began with episode #5, of featuring the Superman stories of the corresponding issue numbers every 25 episodes, this episode features the stories contained in ACTION COMICS issue 100 & SUPERMAN 100. ACTION COMICS 100, September 1946, published around July 16, 1946, 48 pages, 10 cents. Thanks to all of the listeners who have enjoyed these first 100 episodes, and Drew Woodworth, who follows the SUPERMAN FAN PODCAST blog; aaaguilarz, who follows MY PULL LIST blog; Taylor, Chris, both Michaels, Mick, Mike of New York, Ralph of North Jersey, Barry of Chicago, and Brad of Australia, not to mention the podcast FROM CRISIS TO CRISIS, who are members of the SUPERMAN FAN PODCAST group on facebook; and Chris, John, Mick and FROM CRISIS TO CRISIS podcast, who are members of the MY PULL LIST facebook group! NEXT EPISODE: THE DEATH OF SUPERMAN! The Media Frenzy! Episode #99: SUPERMAN: SECRET IDENTITY! The cover to the collected edition of SUPERMAN: SECRET IDENTITY! 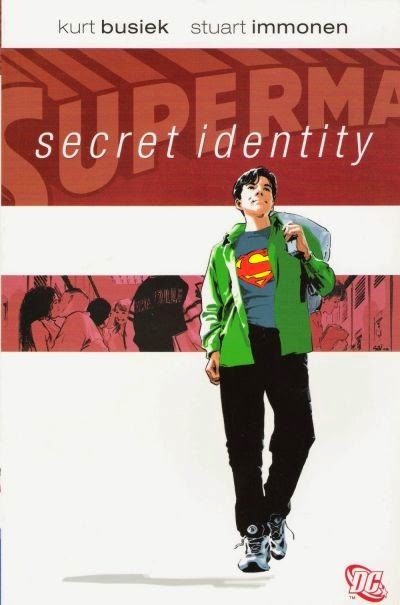 SUPERMAN: SECRET IDENTITY was published as a trade paperback on November 3, 2004. The four issue mini-series was originally released from January - April of that year. The collected edition should still be available. It was written by Kurt Busiek, drawn by Stuart Immonen and lettered by Todd Klein. NEXT WEEK: Episode #100, featuring ACTION COMICS #100 and SUPERMAN #100! SUPERMAN FAN PODCAST can be found at http://thesupermanfanpodcast.blogspot.com . Expanded show notes are at http://supermanfanpodcast.blogspot.com. Send e-mail to supermanfanpodcast@gmail.com .